And so the quest to taste some not-so-common ice cream and ice cream bars found in the Philippines continues. This effort just came out because of so much controversy over the introduction of the Magnum ice cream bars by Selecta, that it has actually caused quite a divide on whether it was just overhyped that it does not justify the price. So after trying the Binggrae brands of Encho and Melona that some have said might be a cheaper alternative to Magnum, here is another Binggrae ice cream, with its own unique twist. 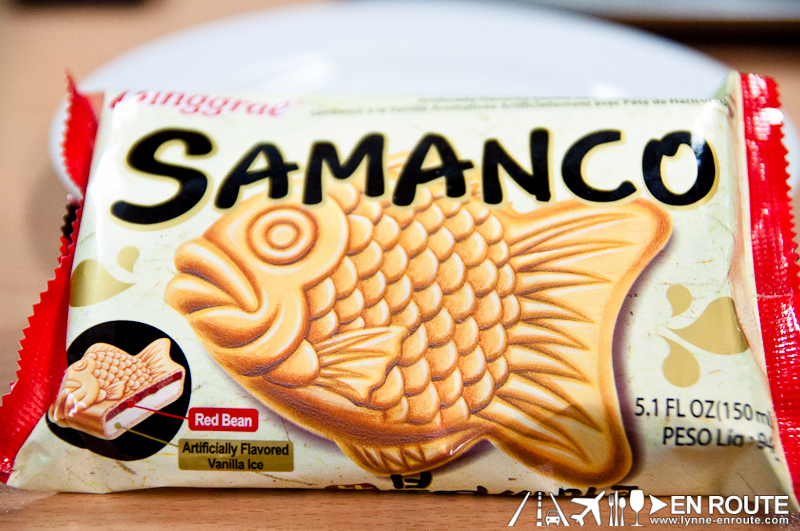 Binggrae Samanco is not really an ice cream bar, but more of an ice cream sandwich. Check out the lower left of the wrapper. 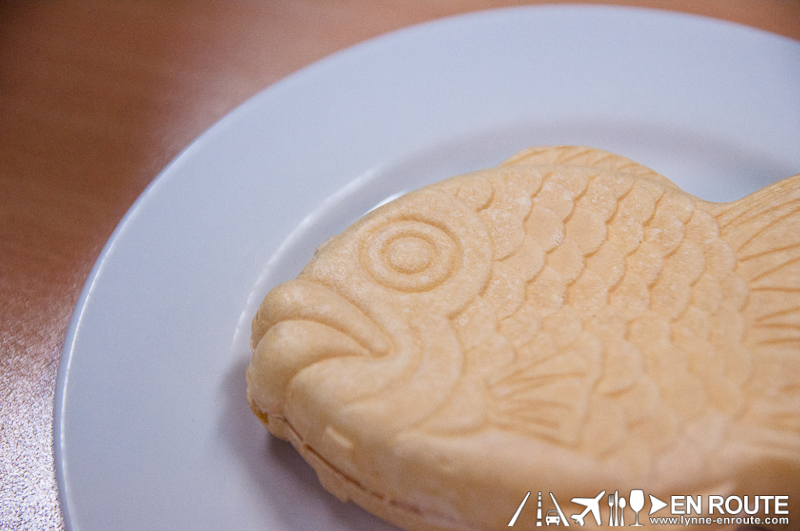 It has ice cream and red bean inside, wrapped in a wafer shaped like a fish. As to why it has to be a fish remains a mystery, and further research is in order for En Route. 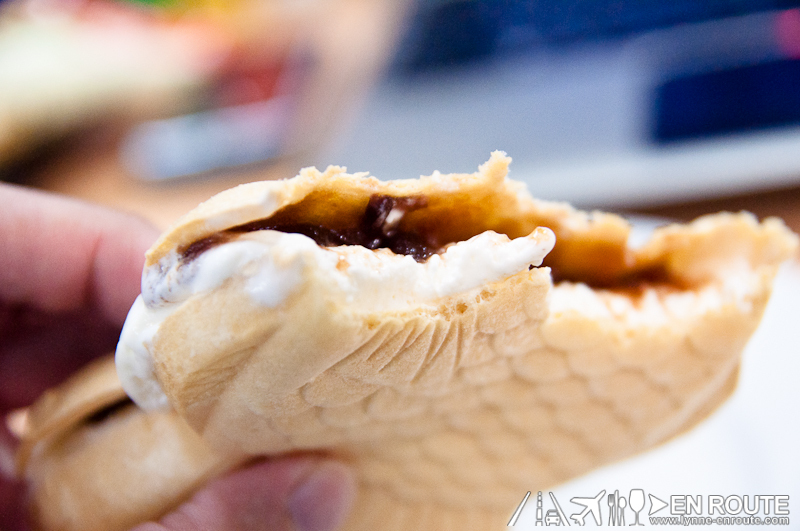 Biting into the Samanco, one will note that the wafer bread will be quite chewy. It doesn’t give in like a crunchy wafer, so bite a bit harder. Also, you will want to eat the Samanco IMMEDIATELY. The ice cream used has a consistency similar to those fast-food Sundaes, so they are very soft and seeps through any small crack. If left to soften up more, you will find the Samanco’s ice cream oozing out like watery goo from all sides. The read bean can be tasted, but the sweetness of the ice cream can overpower it. There is no mistaking its texture, though. Kids will probably love eating Samanco as they are fond of eating treats shaped like different common things. It is also great for those who love some bready-wafer-like texture on their ice cream. Makes you wonder, though: wonder if there are other ice cream sandwiches out there in the Philippines that are just ready to be tasted ;)? I guess I really am more into bittersweet chocolate. I still love the Magnum. 🙂 But I’m willing to try the other Melona flavors.